In practice for many applications, the signal propagation characteristics are not fully known due to the complex environment, such as for an acoustic signal in water. We proposed a model to arrange a number of measurements taken at random locations into a sparse matrix, and proved that the matrix has a unimodal property that can be leveraged to localize the source. We developed a non-parametric localization method based on a smart integration of various modern techniques: sparse matrix completion, eigenspace analysis, singular vector perturbation analysis, and peak localization. The method demonstrates robustness as well as order-wise reduction in the number of sensors over the state-of-the-art baselines. We are now interested in fusing multimodal data, such as energy measurement and time-of-arrival measurement, for better localization performance. We are working on a tensor observation model and developing methods to mine a common unimodal structure using tensor decomposition techniques. Our preliminary result suggests that jointly processing the data in a tensor works better and separately manipulating each data matrix. Our preliminary results can be found in [J13, C15, C16, C18] [Slides] [Preprint]. In the past, statistical predictions were made based on the UAV-to-user distance (as well as elevation angle, etc. ); this approach is not feasible for low altitude UAVs, where deterministic shadowing is the main factor to conquer (or exploit). 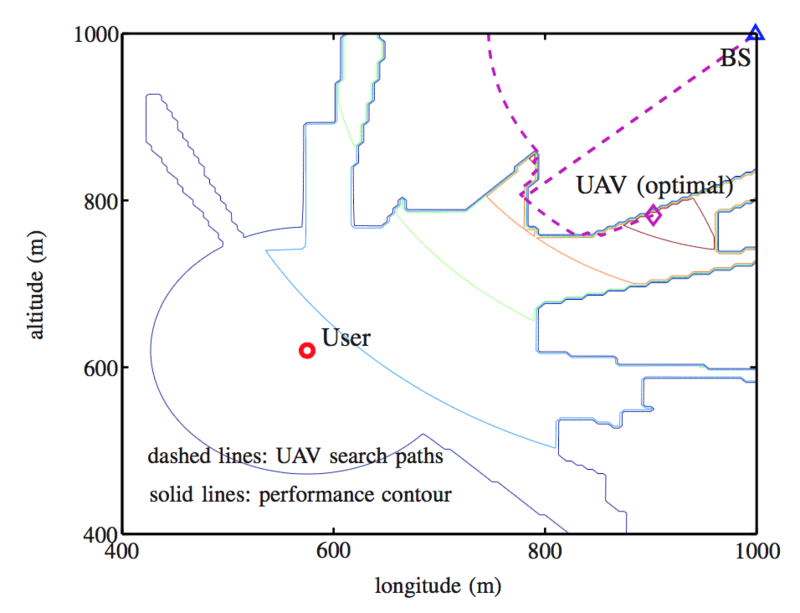 We developed a segmented propagation model and reverse-engineered a hidden multi-class virtual obstacle map from a set of UAV-to-user channel gains measured at different UAV-user location pairs. 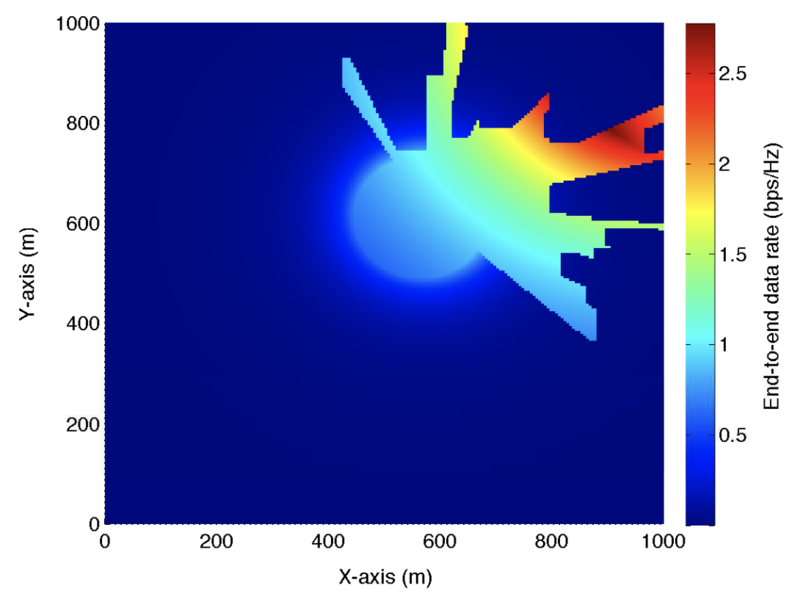 I demonstrated that such a model not only captures the propagation effect of the fine-grained terrain structure (channel prediction error reduced by half compared with baseline), but also yields a nice “nested segmented propagation” property, that can be exploited for optimal UAV positioning. We are now intersted in developing tensor processing techniques to reconstruct the 3D propagation map by exploiting the sparse structure, which can be also observed from the following figures. (iii) How to design a good feedback and precoding strategy under practical D2D (finite rate and latency). J. Chen, H. Yin, L. Cottatellucci, D. Gesbert, “Efficient feedback mechanisms for FDD massive MIMO under user-level cooperation,” IEEE Trans. 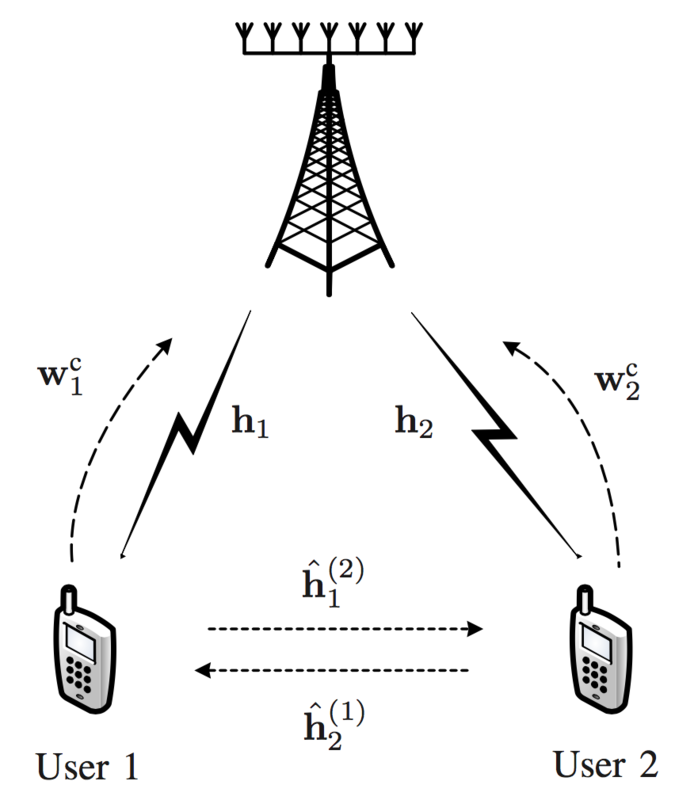 Wireless Commun., 2017, [Preprint] [Code]. We exploited both the spatial and temporal channel correlations to reduce the computational complexity for the precoding. We formulated optimization problems and develop tracking algorithms using compensation techniques and calculus on Grassmann manifolds. The results for point-to-point MIMO and multi-cell multiuser MIMO were presented in the following papers. J. Chen and V. K. N. Lau, “Multi-stream iterative SVD for massive MIMO communication systems under time varying channels,” in Proc. IEEE Int. Conf. Acoustics, Speech, and Signal Processing, Florence, May 2014, pp. 3152–3156. J. Chen and V. K. Lau, “Two-tier precoding for FDD multi-cell massive MIMO time-varying interference networks,” IEEE J. Sel. Areas Commun., vol. 32, no. 6, pp. 1230–1238, Jun. 2014. Cooperation among users can significantly enhance the localization accuracy in GPS-challenging environments. The intuition is that the users can fuse the the location information by taking range measurements with each other. However, cooperation is resource consuming (power and bandwidth etc.) and the outcome is not necessarily fair among agent nodes. Our research addressed these issues by developing distributed link selection and power allocation strategies under different application scenarios. Specifically, we formulated serval resource management games according to different types of resource constraints in the network and studied their solution properties via analyzing game equilibria. We found closed form conditions to determine whether a link should not be considered for cooperation; with that, a lot of coordination overheads among agents can be saved. In particular, we developed a novel link bargaining equilibrium concept, found sufficient conditions where the equilibrium is unique, and proposed iteration that can converge to the unique equilibrium. 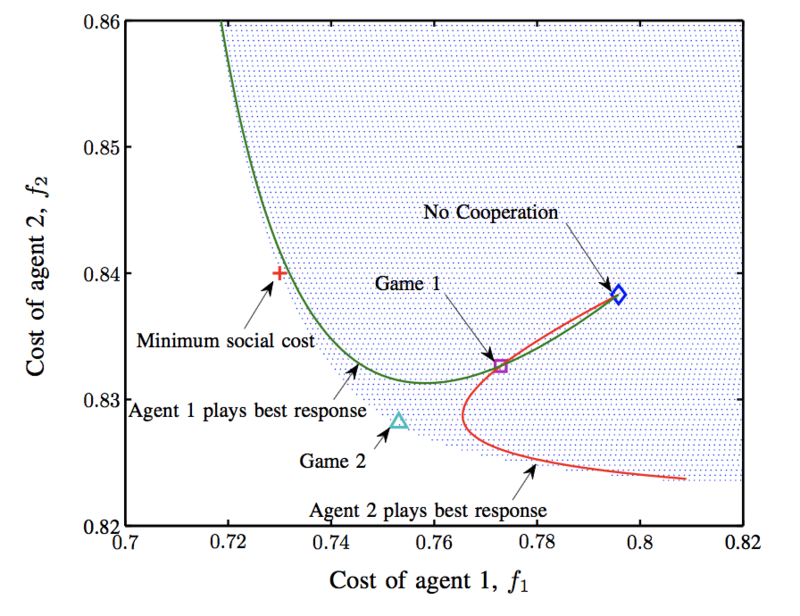 Such a novel game theoretic design and analysis framework may apply to other cooperation networks as well. [J9, J10, C8]. My thesis work focuses on the design and analysis of algorithms for network resource optimization under time-varying channels. The motivation is that network resource optimization usually requires online algorithms with explicit signaling among wireless nodes. 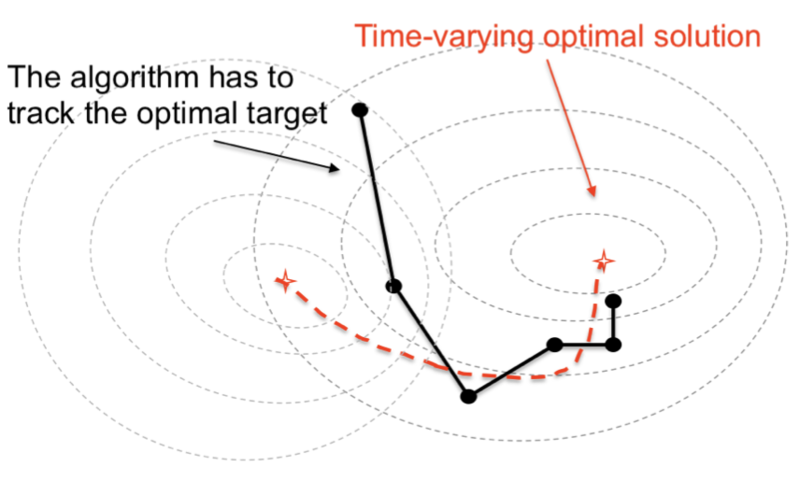 Due to signaling latency, the algorithm cannot converge fast enough, and the time-varying nature of the wireless network yields moving optimal solutions. 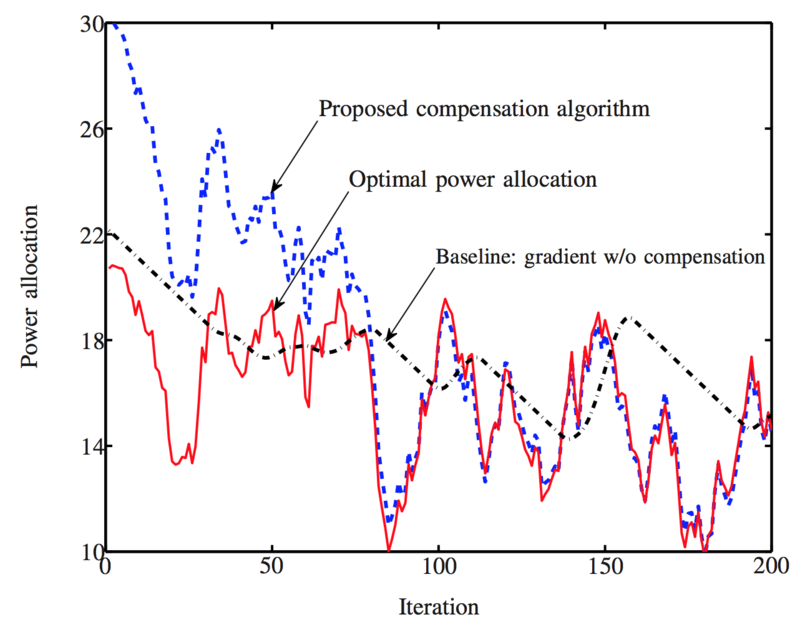 We developed a mathematical framework to analyze the algorithm tracking performance, and based on that, we developed a class of compensation algorithms that predict the potential variation of the unknown optimal solution for enhancing the tracking performance. The algorithm design and analysis framework is summarized in my thesis dissertation [Thesis]. Page generated 2019-04-15 22:39:34 CST, by jemdoc+MathJax.